Is your kid crazy about choo choos? Give your child’s train set an eco upgrade by adding three cars that are on a recycling mission. 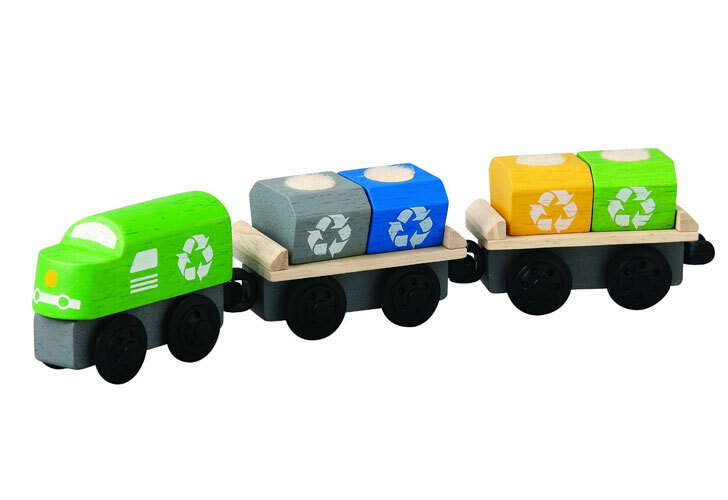 The Recycling Train, which is compatible with all other Plan Toys rail sets, is made from recycled rubberwood and non-toxic finishes. You can use this train to help you explain recycling to your children and what types of items might go in each of the different colored bins aboard the cars. Is your kid crazy about choo choos? Give your child's train set an eco upgrade by adding three cars that are on a recycling mission. The Recycling Train, which is compatible with all other Plan Toys rail sets, is made from recycled rubberwood and non-toxic finishes. You can use this train to help you explain recycling to your children and what types of items might go in each of the different colored bins aboard the cars.